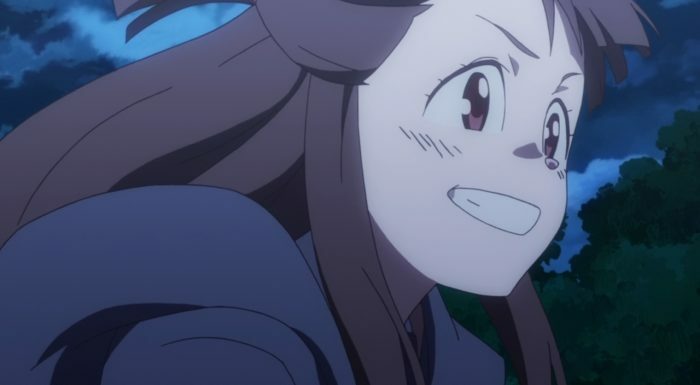 I have to say it was nice surprise to see Akko get some legitimate character development in this episode. 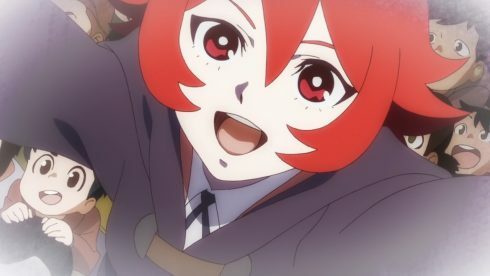 There is always the question of how this development will stick to her going forward, but I’d like to think Trigger will keep this moment as something she doesn’t instantly forget about. 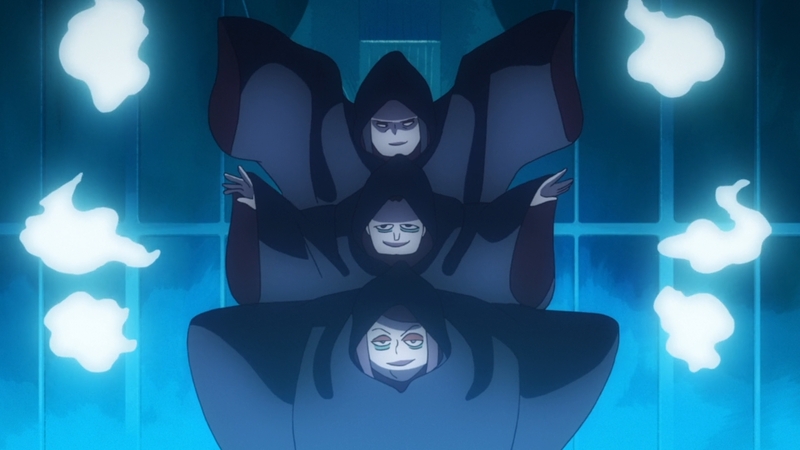 They’ve done a nice job building up this world and the place of magic in it and they continued that in this episode. The nice thing is that Akko got back into the focus a bit and we get to see her actually struggling with her lack of progress. 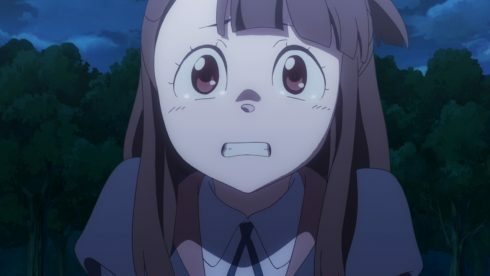 It’d be boring if Akko simply made mistakes and yet never seem concerned by it. Instead we see her wonder if she is just a failure and actually try to seek something that could answer her questions one way or the other. For someone who wants to be like Chariot, Akko’s failures to this point would be disheartening. It’d be weird if she was completely unconcerned about it. She can keep up an entertaining front and is a pretty crazy character, but Akko is still a person. By herself and still failing to accomplish her goal…I could see her becoming doubtful. She found Chariot’s Shiny Rod and used it successfully a couple times to this point. I can understand her thinking “doesn’t this mean I’m secretly special?” That kind of thinking clashing with the failure she’s actually encountered. Honestly her success in the first couple episodes might have resulted in her making more mistakes. If she could do something so amazing without really knowing what she was doing then wouldn’t her hidden abilities surface and lead to her doing normal magic without a problem? 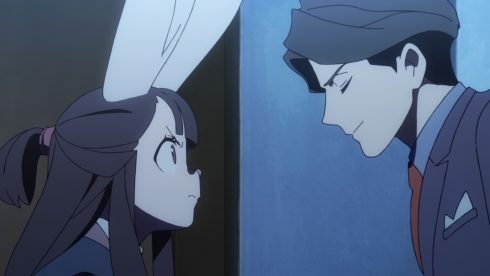 Akko needed this kind of episode. She needed a moment to just see how important hard work is. 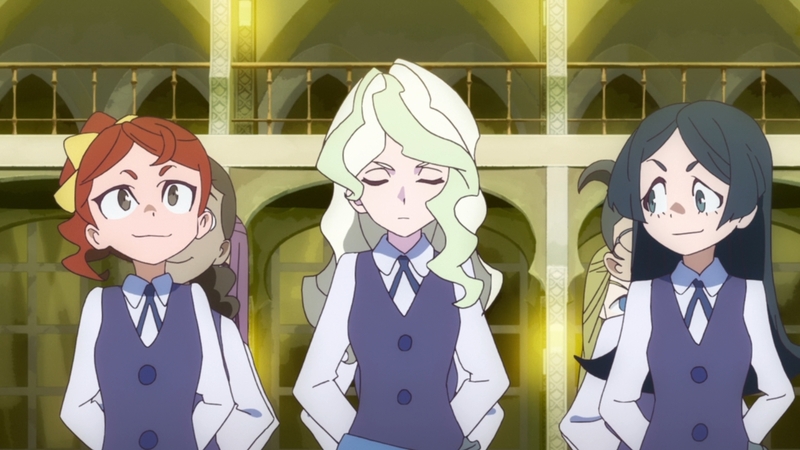 The reality is that Akko is starting from behind most of her classmates. They’ve grown up with magic and have more experience. That is something Akko can only make up for through hard work and effort. She has to work harder than anyone else to eliminate that existing gap. But I can understand why she was so uneasy. She wants to be like her idol, gained the magical staff used by her idol and had some success. Falling short so many times would be discouraging when she needs to be so much better to accomplish her dreams. They used a pretty classic move in letting Akko see that Chariot…wasn’t an instant success. Of course Chariot wasn’t like Diana when she started school. She made mistakes, struggled, and had to work hard to get where she was. 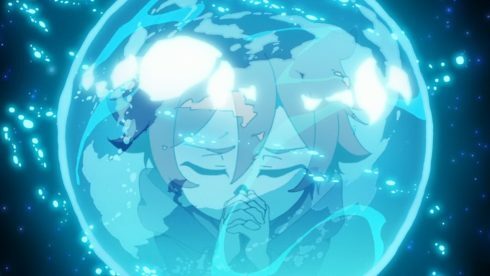 Just like Akko she approached that fountain seeking power to make up for what she currently lacked. The fountain didn’t grant that so she had to find it within herself. 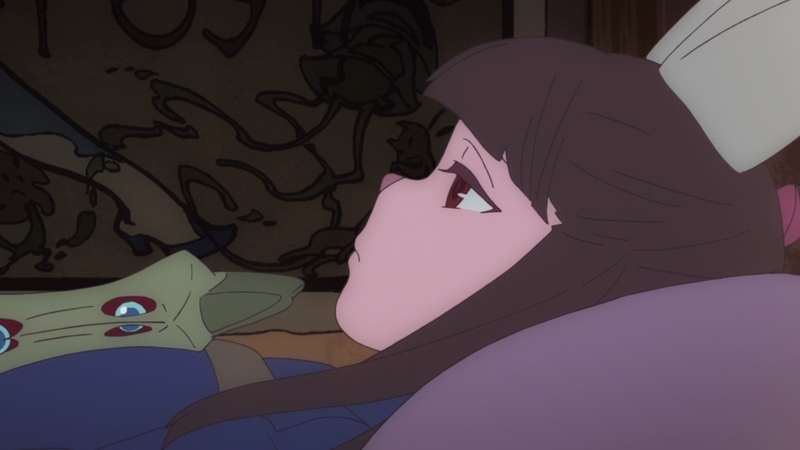 If there’s anything to gain from this for Akko it is that she’s seen what hard work can do. Akko has the same kind of passion that Chariot did and like Chariot there is potential for her. If Akko has anything over most people it is passion. That passion may do nothing on its own, but if she channels it then she can grow faster than those who aren’t as interested in bettering themselves. And yeah they are really blunt with the idea that Ursula is Chariot in this one. They didn’t show her face, but they did show a red haired woman who knew the guardian of that fountain. Not to mention they also showed that woman turning her hair back to Ursula’s hair colour. 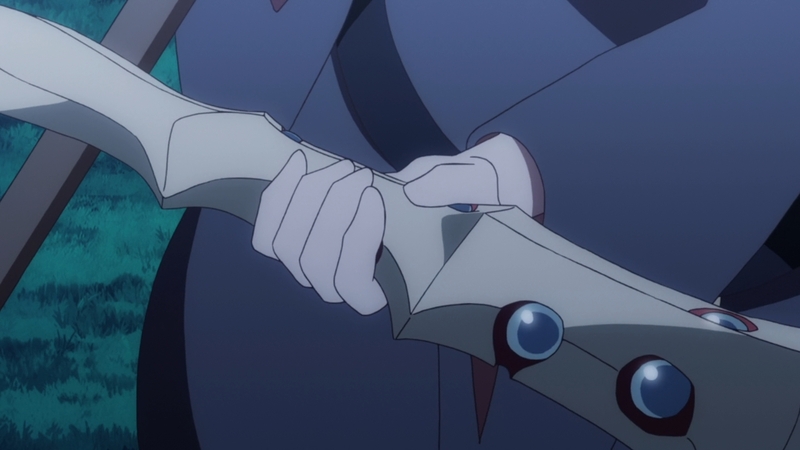 Toss in that Ursula also happened to find the Shiny Rod to return to Akko…and yeah that basically concludes it. One nice thing is that this does explain Chariot’s flashy powers. When she was ready she went to the Fountain of Polaris again and did gain the magic power of the stars. Or at least the fountain injected that power directly into the Shiny Rod and transformed Chariot in turn. 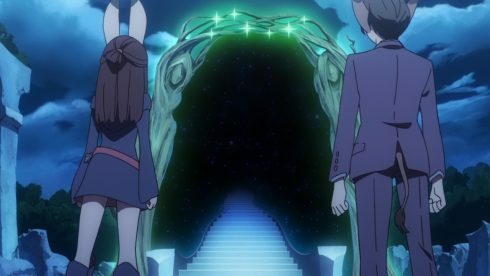 So Akko will likely be returning to that fountain at some point in the future. She’s just not ready for it yet. And I just did like seeing Akko get so emotional in this episode. 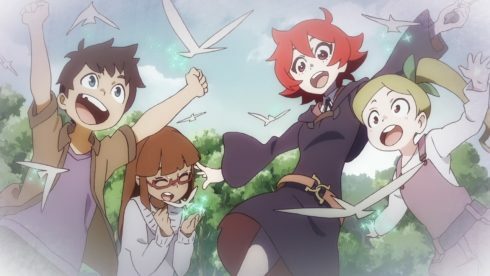 We see the happy and excited Akko, but this shows just how much becoming like Chariot means to her. She doesn’t just casually want to be like Chariot, she really wants it. 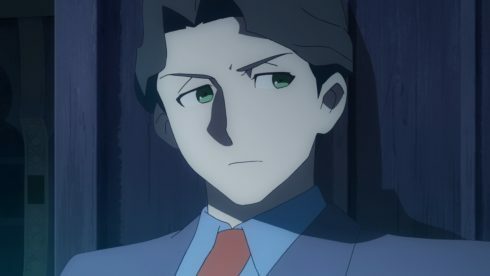 The show does seem to be hinting a lot for Akko’s future. She’s not ready for the fountain, but we know she will eventually. There are all those cards that she can use to unlock the powers of the Shiny Rod. 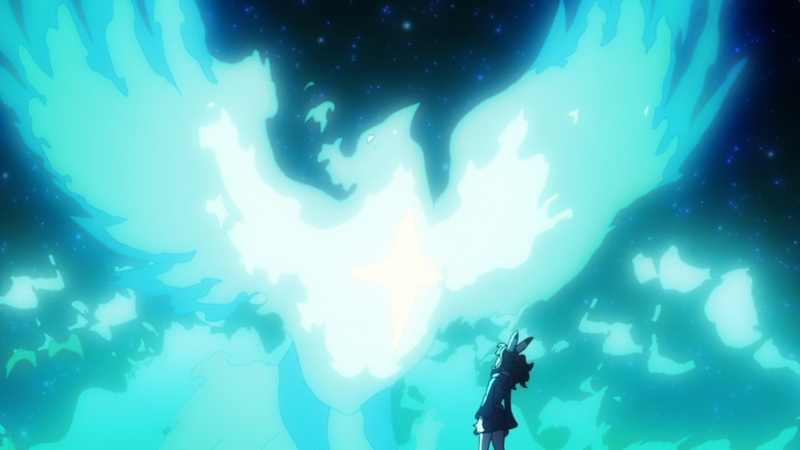 And we even have the Shooting Star broom that Akko temporarily tamed, but wasn’t truly ready for yet. So many little things that are likely to come back when Akko is ready to fully wield them. 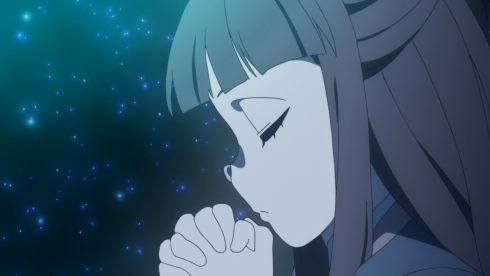 That should mean that there will be a time when Akko needs to be able to use those powers to solve some kind of crisis. It gives me hope for where the story might be going. All of this kind of ignores the other character focused on in this episode, Andrew XD. 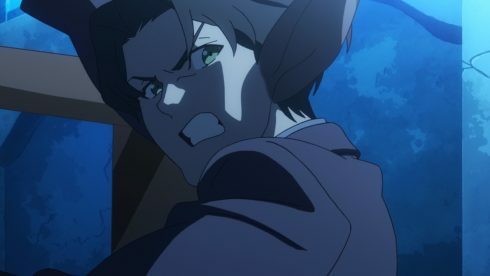 I feel bad for leaving that guy out of it, but Akko’s moments were pretty spectacular in this one. This guy is actually pretty interesting. He starts out pretty similar to his own father in not caring that much about magic or seeing the point of it. Andrew just fits in with Fafnir and other characters that see magic being on its way out of the limelight. He just doesn’t have any interest and doesn’t mind bluntly expressing that. His clash against Diana was kind of fun and you can believe they’ve argued back and forth numerous times. Childhood enemies might be the best way to describe them XD. He didn’t care for Diana’s focus on magic and she didn’t care…for his popularity with girls! His interactions with Akko were pretty fun. Starting out with grabbing the rabbit ears she transformed onto herself XD. They had a decent introduction, a bit of a debate, and then she basically dragged him onto her adventure. Andrew handled himself pretty well considering he got partially transformed (I’m pretty sure into a donkey) and got chased by the Polaris Guardian Arcas. 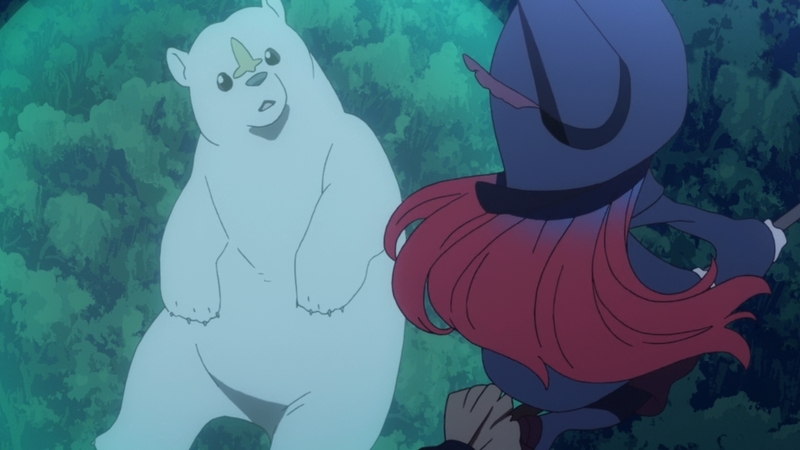 A fairly hilarious moment as well when he and Akko were hanging off a ledge and all she could grab onto was his pants. The belt did a solid job, but…couldn’t quite keep his underwear out of sight. Good fun there with Akko saying it wasn’t on purpose and being sure that Andrew didn’t believe her XD. He got to see some pretty fantastic things and I wonder how his views on magic changed after meeting an odd girl like Akko. 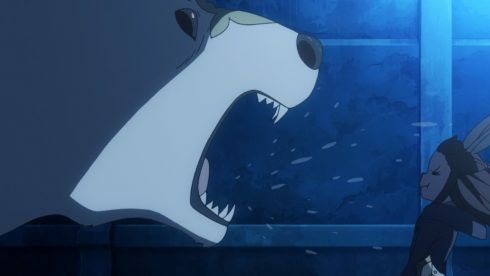 This was a good episode and probably one of my favorites for the show so far. Akko really got a chance to grow and develop in this one. 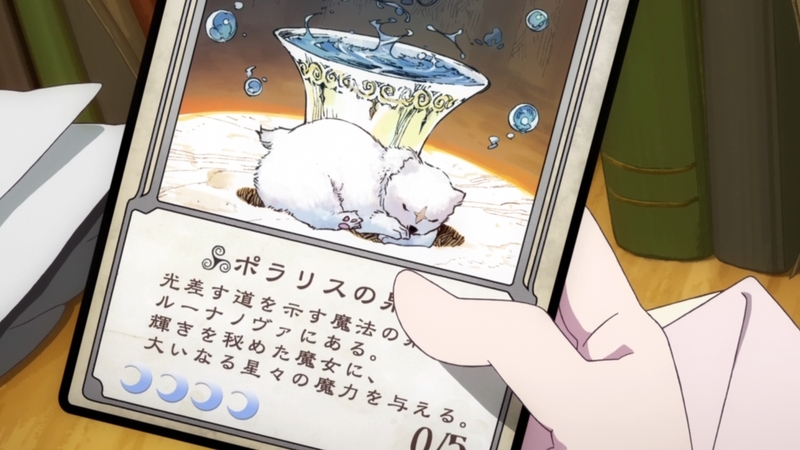 I’d definitely enjoy it if we saw going forward an Akko really trying harder on her own time for learning magic. 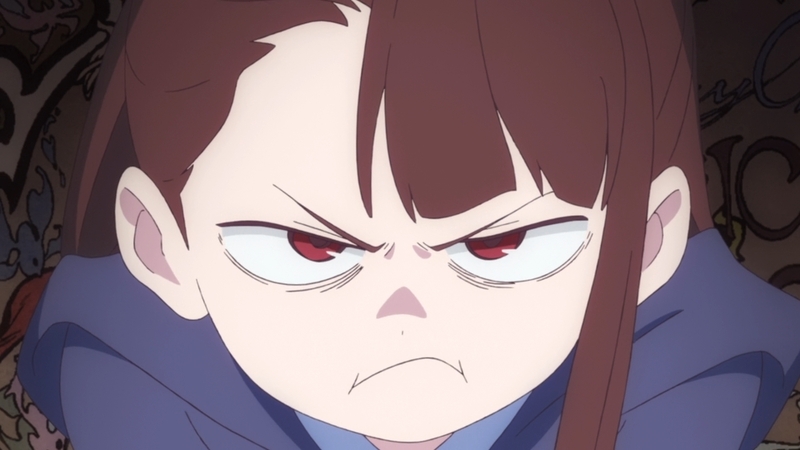 Of course Akko is going to remain a source of comedy and be a bit crazy at times, that’s part of who she is. But I’d like to see this episode carry forward as spurring her to work even harder on learning things. 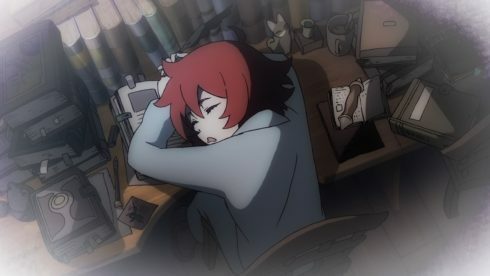 If she wants to catch up and be Chariot then she’s got to put in that kind of effort. 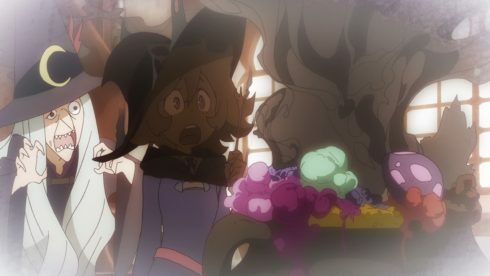 I also just wonder what went through Ursula’s head seeing a girl like Akko so desperate to become like Chariot.